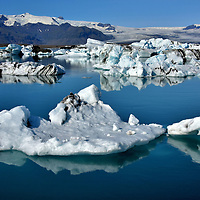 Ísland is often called “The Land of Fire and Ice,” a reference to its active volcanoes and stunning glaciers. 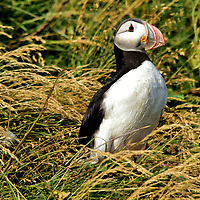 Other impressive features include geysers, hotpots, waterfalls, mountains, coastlines, fjords, landscapes and adorable puffins. Visually experience this incredible country. Then add Iceland to the top of your bucket list. 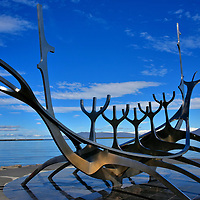 Reykjavík was founded in 874 by a Norse chieftain. The area was predominately farmland until it became a town in 1786. Iceland’s capital city is an inviting blend of unrushed appeal, performing arts, a rainbow of colors and sensational scenery. 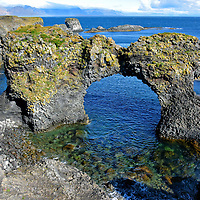 The famous Blue Lagoon is located near the international airport on Reykjanes. 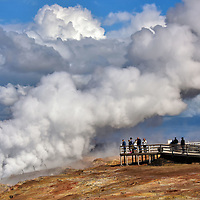 But the peninsula has so much more to see, including lava fields, billowing steam vents, a geopark, a quaint fishing village, Iceland’s oldest lighthouse plus the chance to walk across the Mid-Atlantic Ridge separating the Eurasian and North American continents. 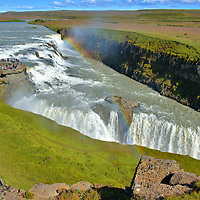 The Golden Circle is a must see when visiting Iceland. Round trip from Reykjavík is about 190 miles, so it makes a perfect daytrip by bus or car to see the highlights: Thingvellir National Park, Geysir Hot Springs and Gullfoss waterfall. If you want to savor the experience, slow down to enjoy the other locations shown in this guide and then lodge for the night in Selfoss. Iceland’s most scenic drive is in the South Region from Seljalandsfoss to Jökulsárlón. Along 157 miles on Route 1 are enough incredible displays of nature to create a lifetime of memories. You will be dazzled by every spectacular waterfall, glacier, mountain, shoreline, sea spire and iceberg you encounter.